An endangered sea turtle that returned to a Maldives beach to lay eggs found the place concreted for Maafaru International Airport runway. The green turtle was born on the historical nesting site in Noonu Atoll islands and had come to the exact for laying eggs. Female sea turtles are known for laying eggs on the same spot they were born. According to reports, the sea turtle may have spent years to travel back to the back to lay eggs. The turtle was found to be in good health and was released into the sea. Sea turtles usually undertake long journeys to lay their eggs on the exact spot they were born. 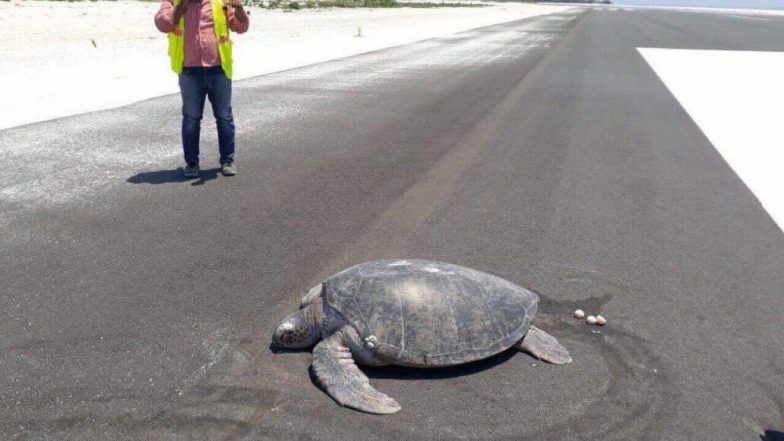 Photo of the turtle with its eggs on the runway went viral after it was shared on social media. The picture is a clear portrayal of wildlife habitat loss or rather how humans encroach animal territory. The World Wildlife Foundation lists sea green turtles as endangered mainly due to loss of nesting beach sites, overharvesting of their eggs, hunting and being caught in fishing gears. Turtles From All Seven Oceans in The World Have Microplastics in Their Body! New Study Reveals Shocking Extents of Plastic Pollution. The Edition quoted a source as saying, "Despite the construction of the runway, the frequency with which turtles visit the island for nesting purposes has not decreased." The runway measuring 2,200 meters is still under construction Maafaru International Airport, which is slated to begin operations in May or June. The construction of the airport completed in August and now there are also plans for a hotel and resort. The runway which is funded by The Abu Dhabi Fund for Development, based in the UAE will be able to accommodate six jets.